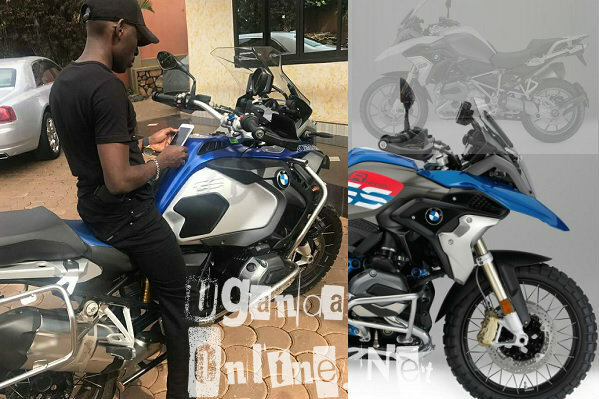 Businessman Sulaiman Kabangala Mbuga (SK Mbuga) was yesterday at his home trying out his latest addition to his fleet, a BMW bike. He engaged the wrong gear that led the bike to move on one wheel and when it fell, it landed on his legs. It happened at his Buziga home at around 1:00 PM. Right now, SK who is in Nakasero Hospital is out of coma with both his legs and arm broken. The entertainment industry can't cope with another tragedy at this time, his fans were worried when the news broke that following the accident, his condition was critical. 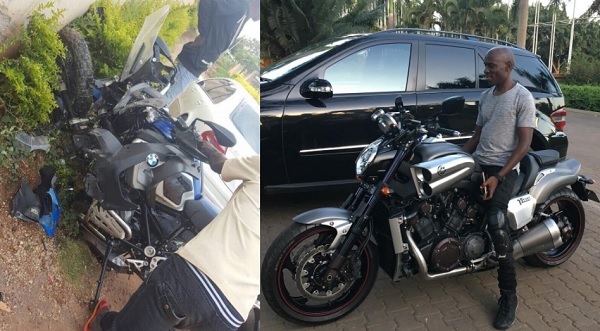 SK and Ivan Semwanga were best of buddies, he pulled out over 8 posh rides to accompany Semwanga's body from the airport to his home in Muyenga. It's hardly a month when Semwanga died and now, SK has survived a motorbike accident that left both his legs and arm broken. He will be operated on today. The monster bike cost him close to 200million. After bringing in a Rolls Royce and Ferrari plus a range of posh rides, Mbuga was now exploring bikes. 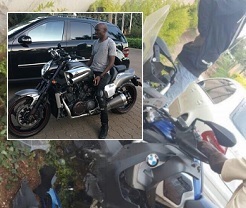 As seen in the above pic, Mbuga is on a different bike compared to the one that has left him cruising on a wheel chair. 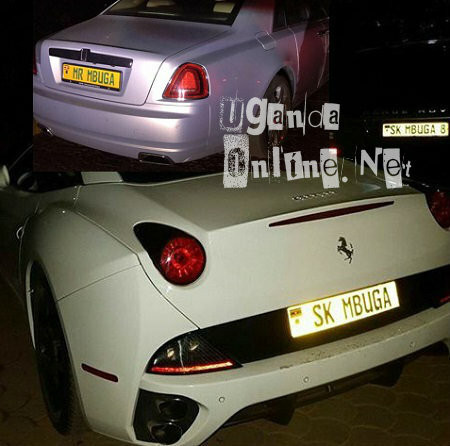 Just like Ivan Semwanga, Mbuga amassed his wealth from South Africa, but opted to return and invest his hard earned dime in Uganda. He is constructing a hospital, more of that here; SK Mbuga constructing a hospital. Loaded as he is, he does not believe in chopping money the way Ivan used to, SK will instead give you ideas, though tight lipped on what exactly he does, all he says is; "I'm an International Commission Agent." 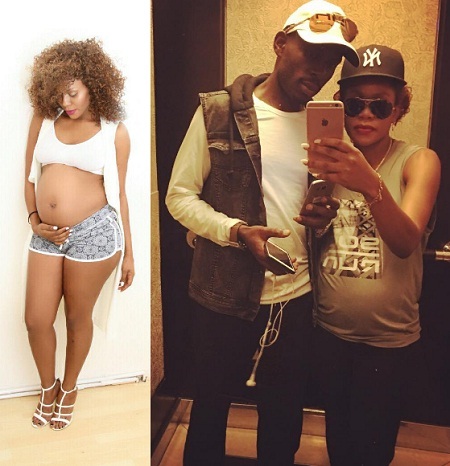 His wife Jalia, who you can call Mama Ferrari is heavily pregnant with their second child. They held their 5billion wedding last year.